A very common request–especially from new low carbers–is for starter low carb meal plans. Well, I’m sorry. Because I don’t have low carb meal plans to offer you and there’s a very simple reason: I’m not you! In my house, it’s just my husband and I. We don’t eat breakfast, but do have dinner together–our main meal of the day–and maybe a light snack at some other point during the day. If you have kids to feed or someone with special dietary needs or a weird work schedule or whatever, your ideal meal plan will be much different mine. There isn’t a perfectly generic, one-size fits all approach that would allow me to crank out the perfect low carb menu plan for YOU. It’s not really a right or wrong way to do it. It’s more a what-works-for-you way to do it, you know? The good news is, if you shop for groceries, you’re already doing a rudimentary form of meal planning. Thinking of it this way makes the process sound much less intimidating, doesn’t it? And it’s true! It may not be formal and it may not even be entirely effective, but recognizing you are already using meal planning skills now is a reasonable place to start. Then you can build on that, from where you are right now. Let go of the notion of perfection and instead, start where you’re at right now. I mean, I consider this a life tip as much as anything else, but it’s super applicable here. Chances are, the bigger the change from how you’ve been doing things, the harder it is to get started and maintain. And easier = more likely to succeed. So easier it is! The process of low carb meal planning is more or less ordinary meal planning, with the additional consideration of your carb targets. Any maybe you don’t think of what you do now as “meal planning,” but if you leave the grocery store with stuff to eat for meals, you’re doing something in that neighborhood. Do you normally check sales before you shop, pick a new recipe to try here and there, choose quick foods for busy nights or keep a running grocery list as you move through the week? That’s meal planning! You will do many of the same things now, but just with your low carb goals in mind. Consider a pantry inventory as step one. You already have some ingredients on hand for food you like to eat. That’s why you bought it to begin with. One of the benefits of meal planning is making good use of the food you have already. Prioritize perishable items and look for ways to use them up first. Then move on to sides to compliment those items. Finally, follow up with new things to try and snacks or treats. Include leftovers in your low carb meal plans. Pretty much nobody will have the time or energy to cook every night. And if you do, more power to you (and what planet are you from)?! Fortunately, most of us don’t require completely different foods every single day. But if we have the same foods too often, we’ll get bored and be more susceptible to straying from our eating goals. So look for a balance of repetition for convenience and variety for interest. Simple to start! Even two or three dinners a week, planned in advance and cooked in bigger batches, makes your life much easier. Index cards can work very well for creating your low carb meal plans, and may be more likely to get used than fancy phone apps with a learning curve. If you note your index cards with at least the name of a dish, ingredients needed and carbs per serving, you can take the cards to the store as a sort of reusable shopping list, or store a week’s worth together as potential options when you’re looking at what to fix. Very old school, low tech but effective. What can you prep ahead? I have silicone hamburger molds, so when I get home from the store, I add some spices to my hamburger and freeze up burger patties right then and there. I may freeze just the hamburger without seasonings for easily defrostable chunks of hamburger to use in other dishes. I may cook up hamburger and sausage to use in casseroles, with spaghetti sauce on zoodles, or in stuffed peppers for example. Whatever you can do ahead will be something your future self will thank you for! Think flexibility as the foundation of your low carb meal plans. A base salad can become all kinds of fancy salads, depending on how you dress it up. Leftover veggies can mixed together or tossed into soups or casseroles. Egg muffins can have all sorts of variations depending on what you have and what you like. Casseroles are great for using up leftovers. Be creative. Or be a little more regimented, if that suits you! If you feel like you’d do better with a definite, prescribed low carb meal plan–because again, everybody is not me–then turn to a specific source for your recipes. TAKING OUT THE CARBAGE has sample meal plans based on the recipes in the book. Keto Academy offers an interactive, online meal planning system. 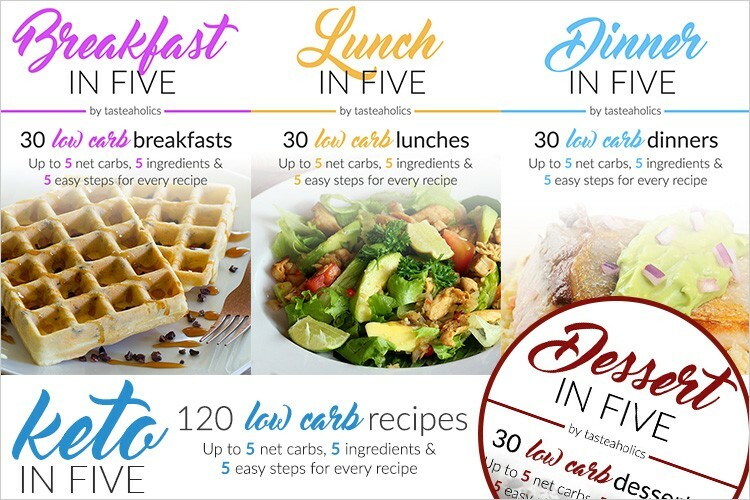 Or try something like the Keto in Five books–Five (normal) ingredients, five steps and five net carbs for each recipe. So a low carb meal plan of 20 net carbs a day would equal 4 servings of any of the recipes in any of the books. You cannot get much simpler than that! The point is, the only “good” low carb meal planning is the kind of low carb meal planning that works for you. I suggest you take account of where you are now and look to incorporate just a little more planning, as simply as you can, building one step at a time and congratulating yourself for every single improvement. In case you haven’t noticed? That’s pretty much always what I recommend. Because it works. What are your favorite tips for low carb meal planning? How do I Get Myself to Stay Low Carb?